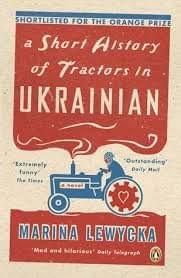 A Short History of Tractors in Ukrainian was bestselling author Marina Lewyckas bestselling debut novel which has sold over one million copies worldwide. Lewycka tells the side-splittingly funny story of two feuding sisters, Vera and Nadezhda, who join forces against their fathers new, gold-digging girlfriend. Two years after my mother died, my father fell in love with a glamorous blonde Ukrainian divorcÃ©e. He was eighty-four and she was thirty-six. She exploded into our lives like a fluffy pink grenade, churning up the murky water, bringing to the surface a sludge of sloughed-off memories, giving the family ghosts a kick up the backside. Sisters Vera and Nadezhda must aside a lifetime of feuding to save their Ã©migrÃ© engineer father from voluptuous gold-digger Valentina. With her proclivity for green satin underwear and boil-in-the-bag cuisine, she will stop at nothing in her pursuit of Western wealth. But the sisters campaign to oust Valentina unearths family secrets, uncovers fifty years of Europes darkest history and sends them back to roots theyd much rather forget . . . .